Morning Talks: Spoken Word Stage, Monday-Sunday 9am-11am. These talks will be brief, well-structured and intimate. Talks will be 5-15 minutes, followed by a short moderated Q & A. Sample Talk titles include: 'Strangers have the best candy,' 'Use your body to end your suffering,' 'How to Make and Eat pickles,' 'Our future is female, how women (and men) will save the world,' 'Robots and morality, How technology is used for and against humanity,' and many. many more. Afternoon Talks: Longer form talks on the Performance Stage, Tuesday-Sunday 4-5pm. Talks will be 45 minutes, followed by a short moderated Q & A. Burning Man is not just a week in the desert - it's a thriving culture that is manifesting year-round across the world. 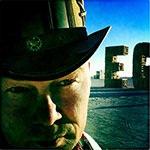 Join Burning Man organizers and affiliates for panel discussions and Q&A's about their global work with artists, regional, non-profit and community groups. Want to expand our culture’s reach and have a positive impact? Come be a part of the conversation! Monday, August 25th- Friday, August 29th, 1 p.m. – 2 p.m.
Monday, August 25th 11:30 a.m. - 12:30 p.m. From the Playa to the Planet What does Burning Man have to offer the world? How has Burning Man changed the way you live? Let's crowd source ideas to affect change and keep the fire burning year round! Tuesday, August 26th 11:30 a.m. – 12:30 p.m. [freespace] Around the GlobeWhat happens when you get a building for $1 and give it to the community?... [freespace] The experiment started in June of 2013 and has quickly spread to cities on 4 continents. Anything goes as long as it's both free and inclusive. [freespace] co-founders and organizers will discuss their model with Q&A. Friday Aug 28th 11:30am - 12:30pm Grants for Interactive Art Worldwide! Since 2003, the Black Rock Arts Foundation Grants to Artists program has supported interactive, community-based art projects around the world. Hear from a panel including past grantees and review committee members about successful strategies for creating playa-like art experiences in the rest of the world, the rest of the year. This is also a great opportunity to ask questions about applying for a grant for your own work.